10 Fun and Tasty Cold Lunch Ideas That Aren't Sandwiches! We are in a cold lunch ideas rut at our house. Every day it’s sandwiches, sandwiches, sandwiches! They are tired of eating them and I’m spent on making them! It has only been 5 weeks of school! I set out on a mission to find 10 different and fun cold lunch ideas to help us get out of this rut! We have a great lunch program at our school, the food is delicious-healthy even most days-and for $2.25 a day, it’s a pretty good deal! When you multiply that cost per meal by the amount of kids I have and the typical 20 days of school in a month….It’s over $150 a month! My kids get to choose one day a week to have hot lunch the rest are cold lunch days. Here are some fun new cold lunch ideas that maybe your kiddo would like too! 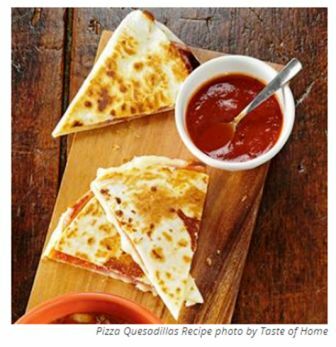 #1: Try these Pizza Quesadillas from Taste of Home! Due to my kid’s preference I’d probably just use pepperoni, but these are great cold or warmed up! I plan to have the kids help me make these the night before they want them! 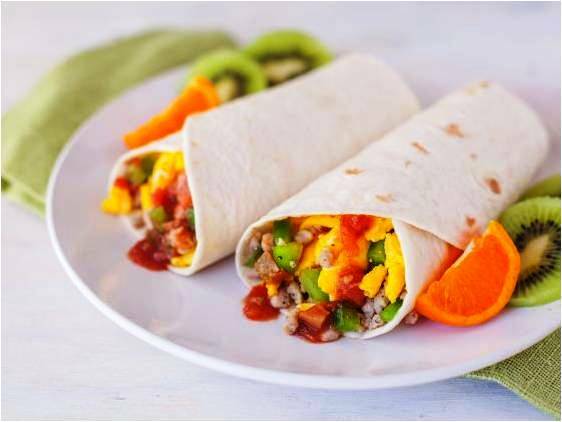 #2: Genius Cooking shared this 4.9 star recipe for breakfast burritos! The best part about these is you can make a bunch, toss them in the freezer and pull them out for lunches! EASY! Photo credit to DianaEatingRichly. 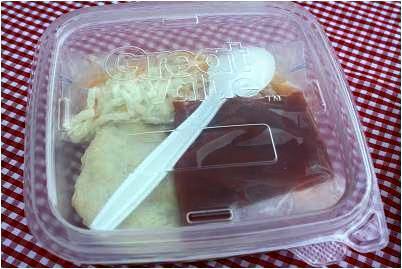 #3: My kids LOVE lunchables, but they are more expensive than the school lunches, so when I saw this post from Mommy’s Kitchen and her homemade pizza lunchable kit looked legit, we all got really excited to try it out! #4: Muffins! I will often make banana bread or muffins and the kids love to take that as lunch instead of a sandwich! 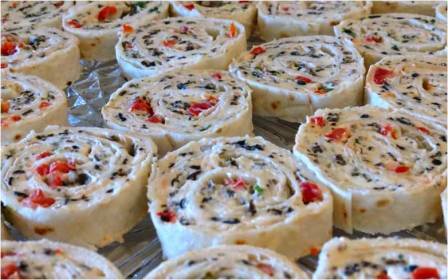 #5: Cream cheese ranch roll ups! We have these for Christmas Eve every year, I can’t believe I haven’t thought to pack them for lunches until now! Stephie Cooks has this great recipe that is worth trying! #6: Breakfast for Lunch! Waffles, pancakes, french toast…yum! 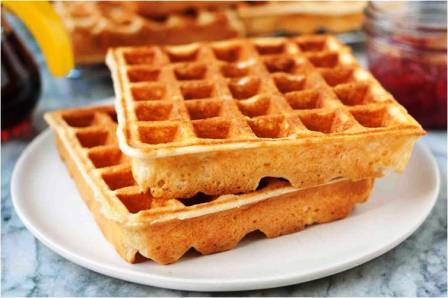 Simply Recipes has an easy to follow waffle recipe here! #7: Taco Tuesday! Easy to do, you can make a little extra the night before and send it for lunch the next day thanks for fun cold lunch ideas Cincy Shopper. #8: Pasta! If they had access to a microwave send them with sauce. If they don’t, send them with some Italian dressing and it can be a cold pasta salad! 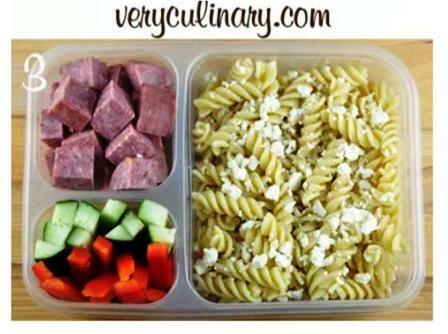 You can even pack little pasta additions on the side like Very Culinary suggests to make it even yummier! #9: Load up that lunchbox with a salad! Some days we toss in a little cottage cheese on the side, tomatoes, soup crackers, and other additions. We had ranch spilling problems and syrup dripping problems in the past when we would put them in Tupperware containers. 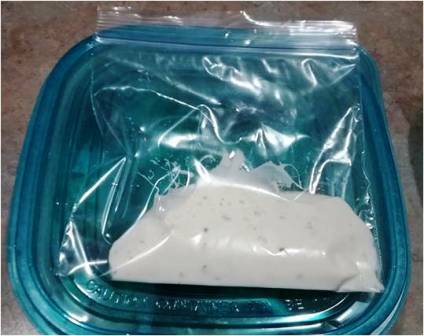 Just this week I took a small size snack zipper baggie poured the ranch in it. When it was time for the kids to add the dressing to their salad, the tore off a little piece of the corner of the bag. No ranch was wasted, there was no mess and no spill! It worked great! 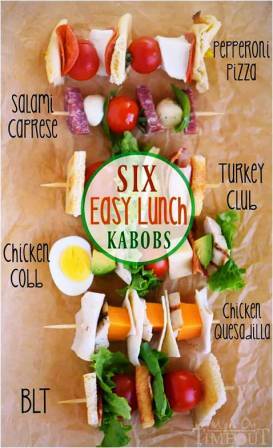 #10: Mom on Timeout hit it on the head when she put together these lunch kabobs! Put food on a stick and they will eat-even if it is sandwich food! 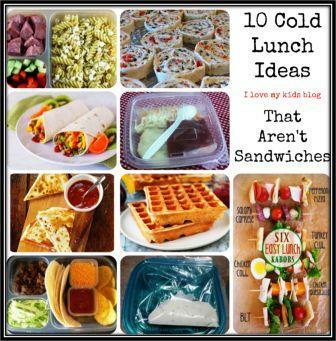 If you are in a cold lunch ideas rut….lets climb out together with these fun ideas! What is your favorite idea in this post? 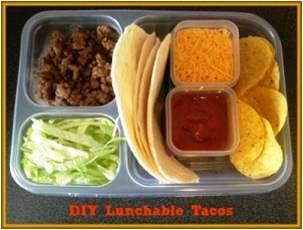 I love the homemade lunchable idea the most, my kids love that!